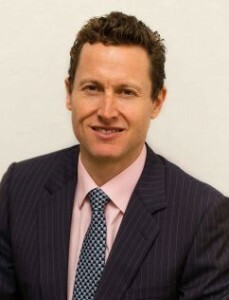 Melbourne, 24 September, 2015: Australian independent investment advisory firm Providence has appointed leading Victorian adviser James Smith to the dual roles of Senior Investment Adviser and Head of its new Melbourne office, in response to strong growth nationwide. Focused on the delivery of informed and independent advice, James will be responsible for the service of the company’s Victorian clients and the continued expansion of the business in the state. With a 122% growth of Funds Under Management (FUM) since 2012, the company is now managing approximately $1bn of funds for individuals, families and not-for-profit organisations across the country. J ames joins Providence with over twenty years’ experience in the investment market, most recently as the Deputy Head of Domestic Sales and Director of Institutional Sales at CIMB Securities, where he was responsible for the delivery of research and investment ideas to Melbourne based equities fund managers. In this role James delivered consistent strong growth for the organisation and opened a new international market in New Zealand in addition to being a member of the organisation’s management committee. Prior to that role, James was the Director of Melbourne Sales for RBS and ABN AMRO, and an Associate Director at Deutsche Bank. Grant Patterson, Managing Director of Providence welcomed James to the team. “At Providence, we take a boutique approach to client relationships, and the addition of such a well-regarded local adviser as James demonstrates our commitment to our Victorian clients”, he said. “James shares our belief in the separation between advice and product, while delivering the highest standard of service. We are delighted to have him apply his institutional investment banking expertise into wealth advisory, for the benefit of our clients”. Celebrating its 15th anniversary this year, Providence has seen a 28% growth in FUM in the past 12 months. The company will continue its growth nationwide from the Sydney and Melbourne offices. After one of the longest bull runs without a 10% correction (45 months – the 3rd longest in history much) fundamentals and mean reversion are back in control. Whatever the excuse markets will find a way to mean revert and expunge exuberant investor behaviour. So what are the catalysts for this correction, where are valuations and what is the outlook for investment portfolios? The search for yield and aversion to negative real returns from cash courtesy of global central banks forced investors into higher risk assets. Emerging markets bonds , global equities and real estate were the biggest beneficiaries. Then the basic human behaviour of greed took hold with record levels of margin loans in the US and China fuelling excessive valuations. Margin loans in the US are approximately 2.7% and has likely played a part in the 45 month bull market (see chart below). The Chinese have approximately 3.5% of the total market cap in outstanding debt, this has spurred a 136% rally in their index, however has also likely played a part in the sudden 41% correction that has recently occurred. Interestingly, the 3.5% Margin Lending to Market Capitalisation ratio is the same level that Australia peaked at prior to the GFC. The Chinese authorities did little to stop the speculation and when the balloon burst they mistakenly tried to prop up the market. So much for their desire to allow market forces to be in control. Credibility has been lost. And that is the big issue: Central Bank credibility. Eight years in from the global financial crisis global growth remains weak despite the huge money printing negative real interest rates orchestrated by global central banks. There is little to show for these policies. Global debt levels remain at record levels , see chart, asset prices have been inflated above fundamentals see charts and interest rates cannot go any lower. There’s no ammunition left, besides attempting to devalue your currency. 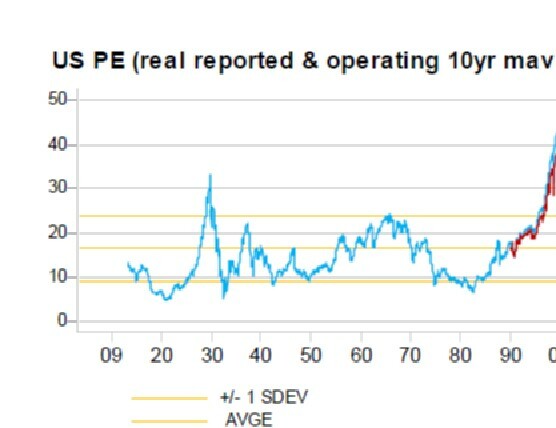 So where are we regarding absolute valuations? 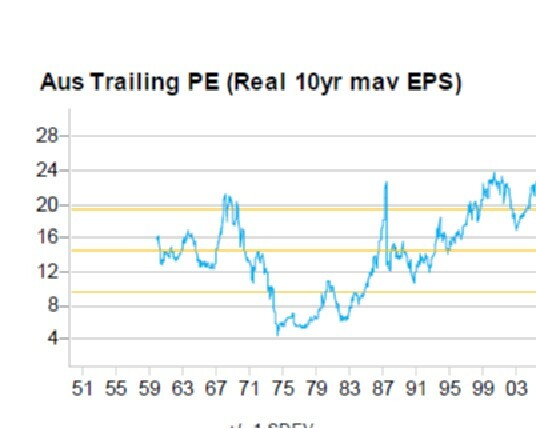 Shiller PE’s (a ratio of price to the average 10 year earnings, also known as cyclically adjusted PE or CAPE) suggest that Australian equities are approaching fair value. 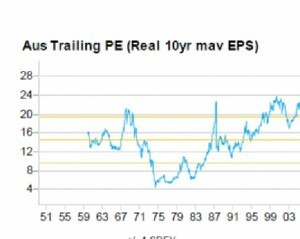 US equities on the other hand, still look relatively expensive despite the recent weakness. 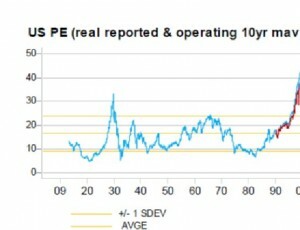 Forwards PE’s suggest that World and US equities are also approaching fair value. So where to now my friend? Continuing market volatility will be a feature with wild oscillations as day traders , computer trading algorithms and headlining press articles leading the way. Value investors will be alert for opportunities in quality equities that get caught up in any sell programs or get dragged along with poorer quality companies. Short term investors will follow the usual pattern of behavioural finance and sell assets at the bottom and revert to cash as the markets correct. There will be some collateral damage although we won’t know where that is until it is. In a low growth environment what are the appropriate valuations on an absolute basis? Our external research provider, Heuristic, demonstrates that US Shiller PE ratios have generally been lower in economic growth environments below 2% p.a and above 6% p.a. 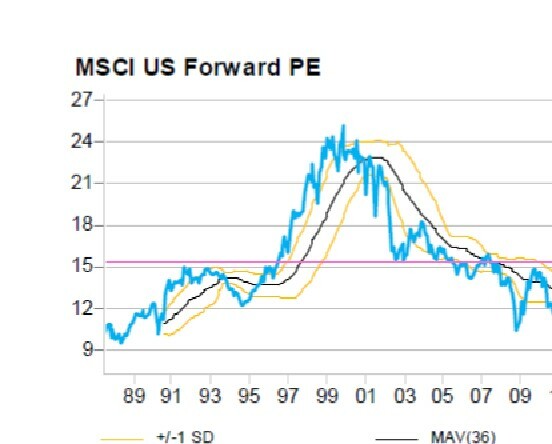 Generally, when growth is below 2% PE ratios have been less dispersed and confined between 10x and 15x. Oh and that brings me to the oil price. The collapse in the oil price is eventually stimulatory for the global economy. Costs for manufacturing and transport will plummet. The current environment is a reminder of how day to day movements in market are totally irrelevant to long term investment planning. We continue to urge people to look through the short term noise. At Providence we have been running 15-20% cash weightings , increased exposure to alternative funds that benefit from higher volatility and been running a short AUD exposure for international equities. This strategy has been successful in dampening volatility and protecting the capital value of investment portfolios. The key now is having the confidence to deploy that patient capital once value emerges…..as long as we have faith in the global central banks!